1,500 anti-Narmada dam protesters, leader Medha Patkar detained in Bhopal, released following all-India "pressure"
In a major swoop, the Madhya Pradesh police on Wednesday morning detained approximately 1,500 on protesting Narmada Bachao Andolan (NBA) activists and supporters at the Bhopal railway station soon they got down. 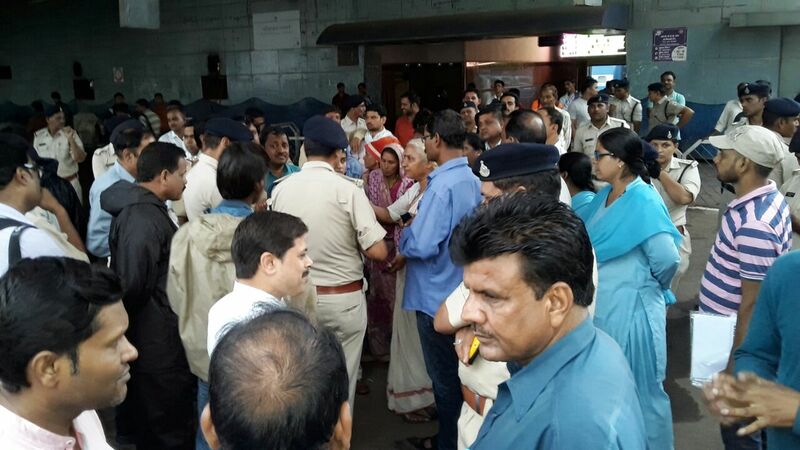 The NBA activists were first taken to Habibgunj Railway Station and then to Central Jail, Gandhi Nagar, Bhopal. 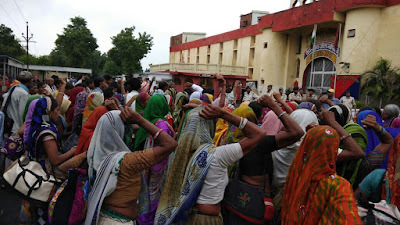 Among those who were arrested a little later were NBA leader Medha Patkar and Aam Aadmi Party leader Alok Agrawal, when they were seeking to go and meet chief minister Shivraj Singh Chauhan. They were also taken to the Central Jail. The activists and their supporters had planned a protest against the alleged unilateral decision of the inter-state Narmada Control Authority (NCA) to close the Narmada dam’s 30-odd gates in order to fill up waters in the reservoir up to 138.64 metres. The NBA claims, as many as 192 villages and one town would be submerged as a result of the NCA decision, displacing 40,000 families. It cites government figures to say that at least 18,000 families would be displaced and need to be rehabilitated. The rehabilitation sites, it alleges, are still not prepared for them to be livable. In the evening, at around 4.30 pm they were let off, following “pressure from large sections of people, including activists, politicians, and intellectuals from across India”, NBA said in a communiqué. Soon after the detention, the NBA issued an open appeal, seeking support from politicians, activists and intellectuals, asking them to approach by phone, fax and email the DGP, Madhya Pradesh, and the Madhya Pradesh chief minister, among others, to build pressure to release them. Earlier on Tuesday, in Delhi, the police swooped on protesting NBA activists under the leadership of Patkar, who protested in what they called “Coffin Satyagraha”. 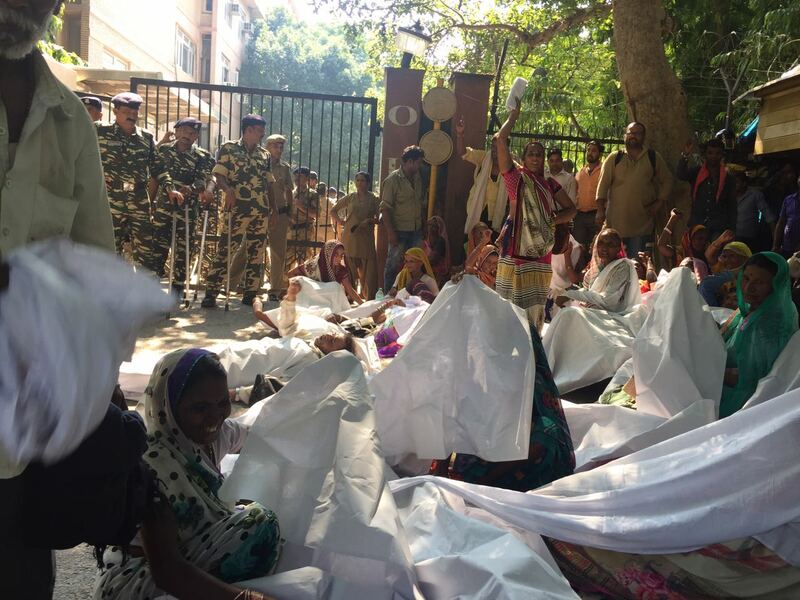 Narmada dam affected women lied down in front of the Water Resources Ministry building, covering themselves with a white shroud. The police removed them. When the protesting women, about 100 of them, refused to budge, the police used lathicharge to remove them. A few of the women sustained injuries. Six women were taken to the hospital, while four went unconscious during the melee. The protest followed NBA leaders’ hour-long meeting with Union water resources secretary Amarjit Singh, telling him about the danger of displacement looming large over tens of thousands of people. Singh, on his part, cited figures to show nothing of the sort would happen, and the protesters’ apprehensions were wrong.